It was not a Heisman moment. Mike Rozier fielded the opening kickoff of the Kansas State game in 1983 deep in the end zone, took the ball out to the 1-yard line, then stepped back into the end zone where he was smothered by tacklers for a safety. The Wildcats led 2-0 just 6 seconds into the game. In early December of ‘83, at the Double Hundred Celebration honoring Bob Devaney and Tom Osborne as the first college coaches to reach 100 victories back-to-back at the same school, former university president and chancellor “Woody” Varner referred to Rozier as the “great humanitarian” for giving Kansas State, which had lost its first three Big Eight games, two points. Just over 5 minutes later, following an interception by Husker safety Bret Clark, Rozier capped a seven-play, 81-yard drive with a 4-yard touchdown run. By the end of the first quarter Nebraska led 21-2. By halftime the lead had increased to 38-5, with Rozier scoring two second-quarter touchdowns, on the way to a 51-25 victory. The Wildcats cut the deficit to 38-25 with 8:57 remaining in the game. But could get no closer. Rozier offset his unintended “humanitarian” gesture by rushing for 227 yards and the three touchdowns, on only 23 carries, an average of just under 10 yards per carry. He rushed for 71 yards on 16 carries in the Kickoff Classic, the only time an opponent would hold him under 100 yards all season, “but I earned every one of them,” he said. With the 227 rushing yards, Rozier moved up to second on the Big Eight’s career-rushing list, moving past Oklahoma’s Steve Owens and Joe Washington. Oklahoma State’s Terry Miller ranked first, with 4,582 rushing yards in four seasons (1974-77). Rozier had 4,078 yards in fewer than three seasons. “I’m happy with the way I played,” said Rozier. Except for the safety, of course. As his rushing yardage and touchdowns reflected. Quarterback Turner Gill also rushed for three touchdowns. Kansas State managed 377 yards against the Blackshirts, including 148 in a scoreless third quarter. But Nebraska forced five turnovers, three interceptions and two fumble recoveries, and sacked Stan Weber four times. Linebackers Mike Knox and Mark Daum led the way with 14 and 12 tackles, respectively. Defensive tackle Rob Stuckey was credited with 10 tackles, with one of the sacks. Jim Skow, also a defensive tackle, returned an interceptions 31 yards for a touchdown. That’s about what happened in the next two games. 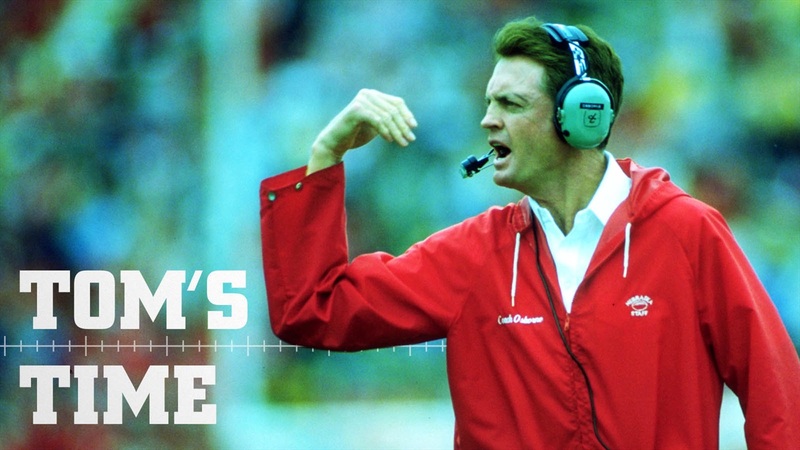 Tom's Time is a regular feature that will take a closer look at the life of Tom Osborne. Nebraska has a storied history in football that dates back to the earliest years of the game, but the tradition to which Husker fans hold Nebraska is mostly a reference to Osborne's 25 years as head coach. And that will always be worth exploring in greater detail. Click here for all of the entries in the series.